We had a bevy of reports today, starting with CONAB this morning which was neutral for soybeans (113 MMT beans/87.5 MMT corn) and bullish for corn. We then had USDA exports that were fantastic with a capital ‘F’ for corn, beans and cotton. 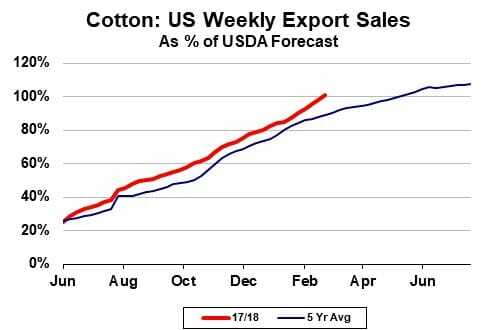 Followed by maybe one of the most bullish USDA WASDE reports for corn in the last few years, along with supportive numbers in cotton as well. 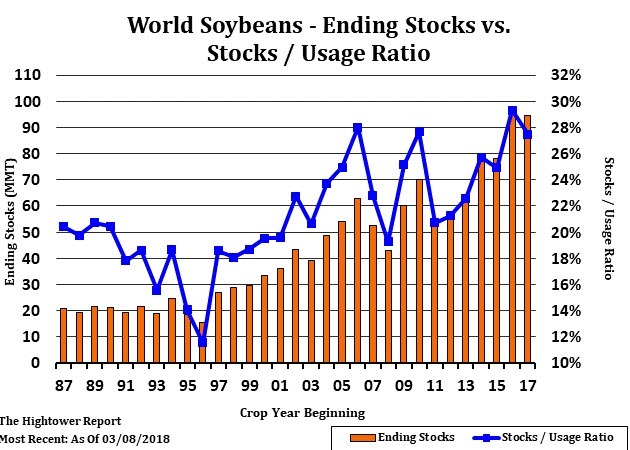 USDA WASDE for beans was more neutral from the US perspective, but the global balance sheet remains in contraction and should support longer term. The report i could be considered bearish for wheat but considering new crop yields were not even discussed, it is really pointless to worry about wheat until we know more about what the new crop looks like. CORN: Let’s start with corn. As I mentioned before, CONAB put Brazil corn at 87.5 MMT, well below where the USDA put Brazilian numbers at 92.5. 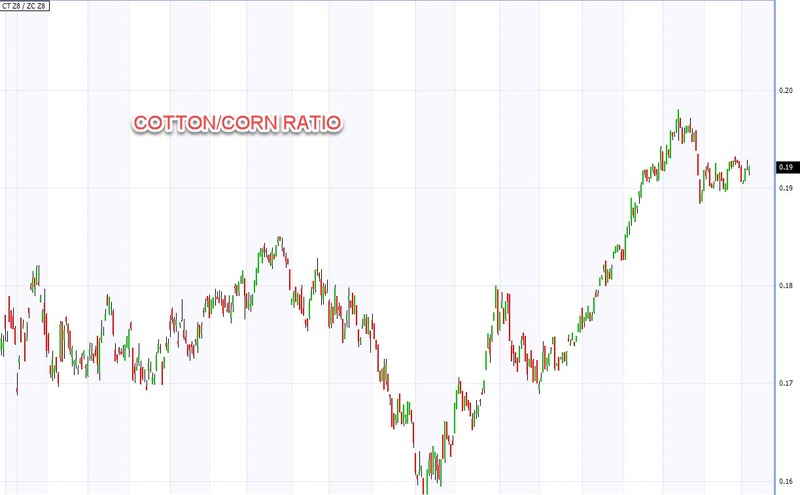 This only adds to the bullish story in corn down the road given. 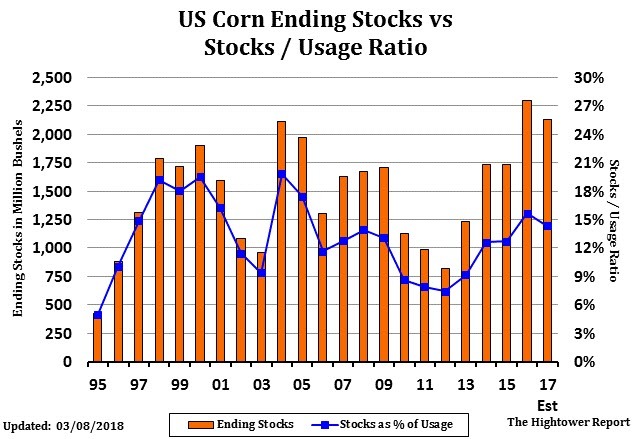 5 MMT is almost 200 million bushels of difference, which means the USDA will be expected to bring world stocks down in the coming reports and maybe increase US demand even more. If the USDA had matched the Brazilians, this would have been even more bullish of a day. The domestic side of the WASDE saw a surprise increase in 2017/18 US corn exports of 175 million bushels, which with a hike in ethanol by 50 million raised demand by 225 million bushels. The result is a forward carry down from 2.3 down to just over 2.1 billion. As you can see, stocks to use in the US creeping back down to 13-14 levels when front corn was trading north of 450. That is very possible this summer for old crop corn. 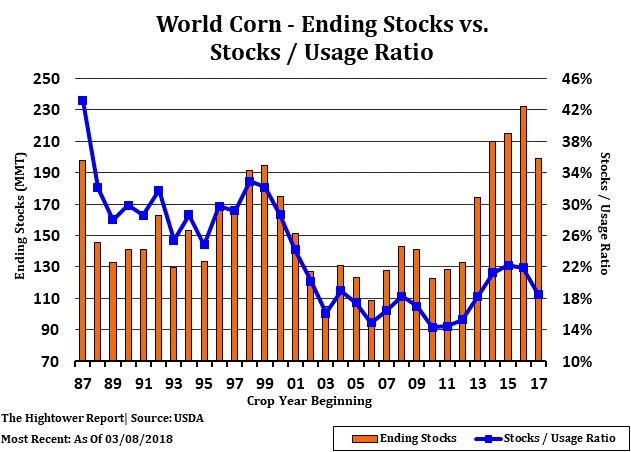 World 2017/18 corn stocks fell to 199 MMTs, the first time that world corn stocks have been below 200 MMTs since 2014/15. This is the important take away. Analysts like to talk about US supply, but the bottom line is the global corn market is looking at a 20% supply drop since last year. The ending stock fall included an Argentina corn crop of 36 MMT and a Brazilian of 92.5 MMT as I mentioned above. I think the Argentina numbers are probably 120 million bushels (3 mt) too high and Brazil 200 million bushels (5 MMT) too high. This means we could be closer to 190 MT, BEFORE the US puts its crop in the ground. SOYBEANS: The day started with CONAB putting bean numbers in Brazil at 113 MMT, followed by a fantastic export number. We saw almost 2.5 MMT moved last week as the Chinese came back from holiday. This is important to remember. Prices fall when demand gets rationed, today’s export number did little to show rationing. 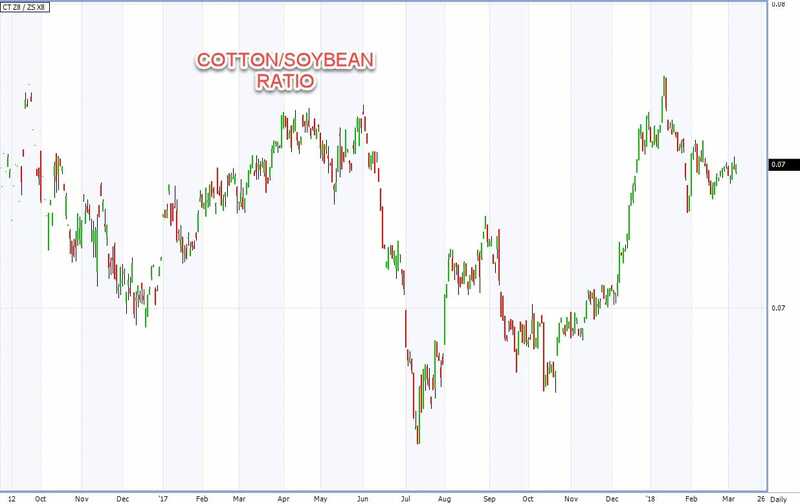 We traded at almost yearly highs in old crop beans last week and we saw this massive number. It has to mean something. US beans are the cheapest in the world, tariffs or not China will be a featured buyer. 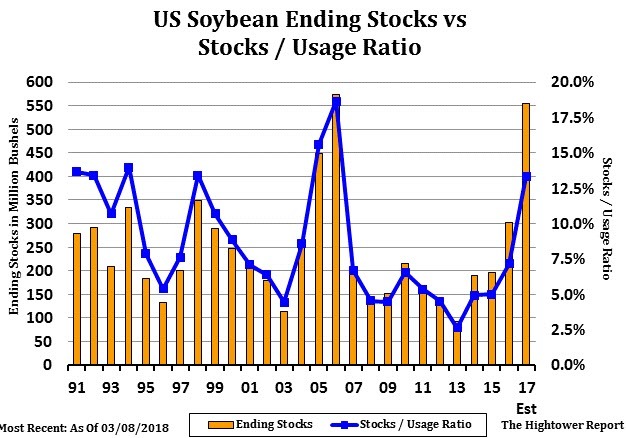 The USDA balance sheet does not paint a pretty picture when it comes to soybeans. We are looking at a 550 million bushel carryout at these numbers, which is about 250 million where we ended up a year ago. The caveat to all of this is that we have been projecting high numbers for years but the market seems to move more beans than expected in Q2/Q3 and the balance sheet falls. The question going forward is about these weekly export numbers. Can buyers continue to pull 1.5-2.0 MMT per week away from US suppliers? If they can, we could see prices stabilize here and the carryout numbers fall. WASDE was not bullish beans, but the corn report being bullish should support new crop prices. Much of the bearish outlook on new crop is factoring in 92-93 million acres of beans. It will be really interesting to see how the acreage battle plays out now that corn is back in the game. We could see 90-93 million acres of soy, much of it depending on how beans trade against corn in the coming weeks. Now, the global numbers paint a different picture. Even with all of these US supplies, were still looking at an old crop supply number below than a year ago by 3-5 MMT and that is BEFORE bringing Argentina numbers down closer to 42 from 46 where the USDA put them today. (Rain in Argentina over the short term will hold some sway over price in this aspect). 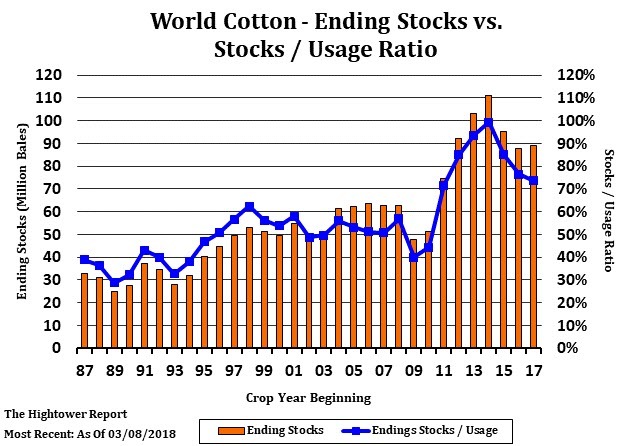 Lower prices can certainly be argued, but looking at smaller global supplies against the Chinese demand back drop has me thinking we are looking at a more sideways market rather than a lower one as we get into the new crop growing season. Acreage in the US will be needed globally, regardless of the US balance sheet. I would be more apt to sell new crop beans rather than new crop corn, but I am more for keeping powder dry until later this summer when we start to see the yield threats kick in. Right now I do not believe corn is high enough vs beans to pull acreage, I think we need to see the ratio closer to 2.4. That said, most farmers blow smoke at me when I ask this question. They say “beans” for 6 months and then when it comes spring, they are out there with the nitrogen. 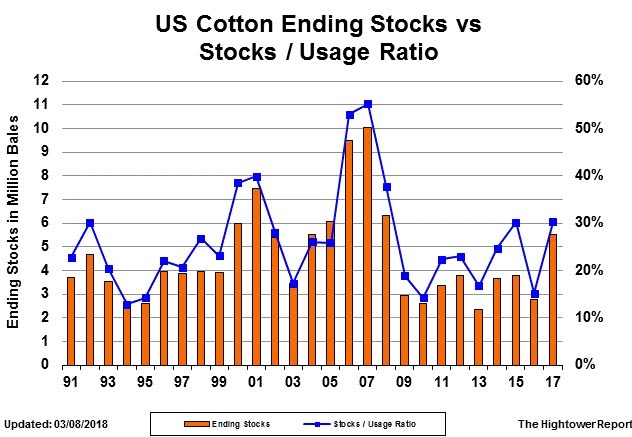 COTTON: Cotton numbers were bullish as well to start the day. Exports were fantastic again, with another 400 k bales of old crop committed. Exports are just on fire, trading well above the 5 year average, increasing when they normally tail off. We have now committed 100% of the projected exports put forth by the USDA with three months to go. WASDE finally gave the bulls the export cut they have been calling for. I expect this is the first on many to come before the end of the year. I highly doubt we see prices fall much unless we get a new crop story from India or the US that really trumps the short term demand. Carryout is now 5.5 million bales vs 2.8 a year ago, but keep in mind that 2.8 number was in the 4’s when we were at this point a year ago. 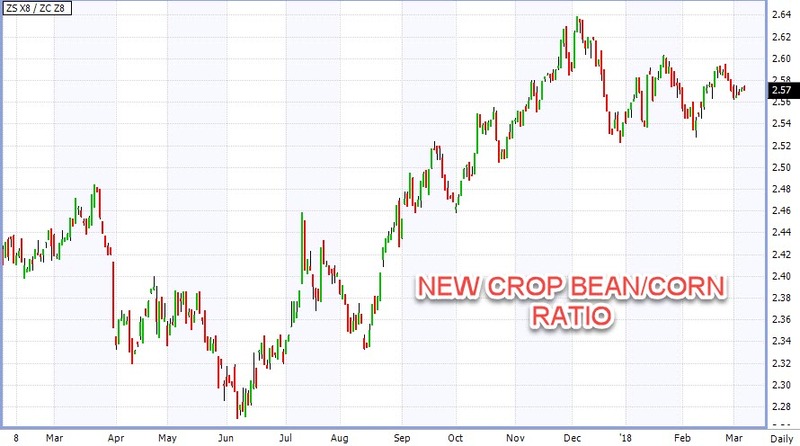 New crop production will be needed to get carry above that 6.0 level, which might be harder now given the better prices we are seeing when it comes to corn and soybeans. Throw in a drought in West Texas and you have a recipe for prices to stay strong through the cotton planting. Cotton vs Corn is starting to tilt back toward corn and beans. Exports should support old crop in the short term and the acreage battle/drought in Texas should support in the new crop for now. Keep an eye on those weekly exports, when they start to fall back toward 100-150k per week in old crop, I think the high will be in for May and July at that point. Wheat markets were a side show today. We did see HRW demand fall after a poor export number this morning. Prices are obviously being rationed at this point. The question is what production is going to look like in terms of actual numbers. At this point it is a complete guess to the market. Winds have been howling out west and right now it looks like we will get to that conditions report in April with no moisture from the Texas panhandle to western Kansas in the last 150 days. Once we get to April, conditions will begin to be a conversation topic with the USDA. That is when the bull story can really develop. I think wheat is more likely to chop in the short term as it looks to be back in 3rd place at the CBOT behind corn and beans for now. The next big report is at the end of March with Grain Stocks and Perspective Acreage reports featured. Until then let the acreage battle begin! DING DING! USDA grain reports have the potential to move markets. This guide outlines the weekly, monthly, quarterly, and annual reports.